At the new San Juan Villicum WorlSBK circuit, Xavi Fores once again gave the official Ducati riders such a hard time on his Barni Racing Panigale that he beat them both in race two, finishing second only to Rea and only just over three seconds behind. From his pole position in race two he was aggressive but controlled in the lead, with Rea going past just before half race distance. 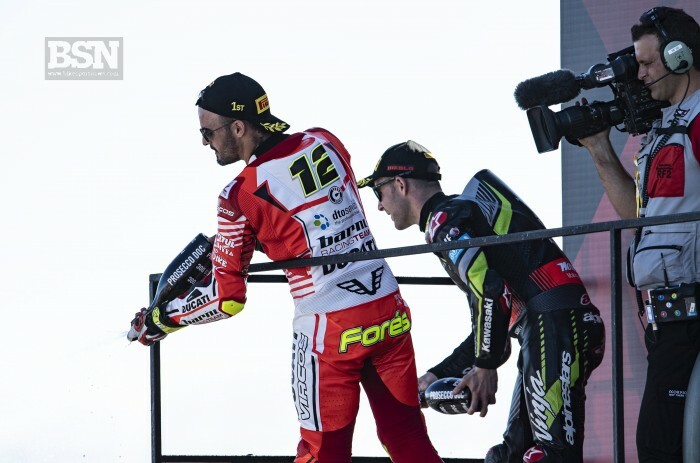 This was Fores fifth podium of the season, on a weekend where Toprak Razgatlioglu also showed that the privateers – or Independent Riders in Dorna speak – can have their day too, especially when the factory teams have no more data to start off with at a new track than them. Fores and Razgatlioglu’s machines are of course very, very similar to the official ones, the rules and cost capping of parts dictate it now, but Fores taking the top privateer mantle for the year is well deserved for a rider who started strong, had a relative mid season dip, but recovered strongly. Shame that he will almost certainly be ousted from his team in 2018… Another good rider with no immediate offer on the table. To win the championship-within-a championship was a big deal for Fores, but his aims are even higher on a personal level. To compete with all the official entries, not just be the best privateers. One more race weekend for Fores and all in WorldSBK, at Losail under the floodlights in two weeks’ time.